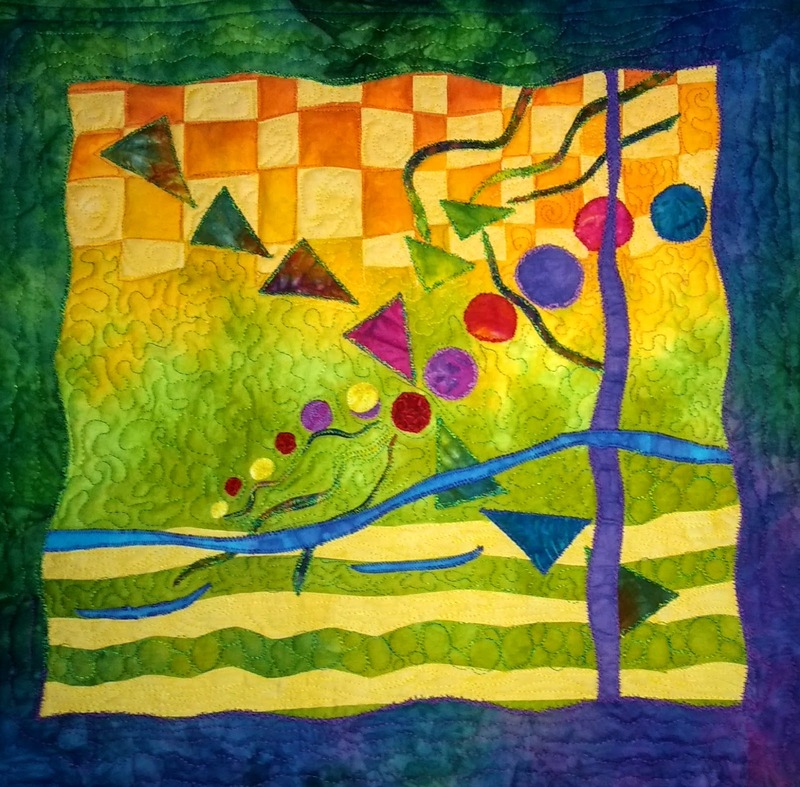 The Garden Path quilt had been waiting patiently to be quilted until Wednesday. Abby, the muse, said seductively, "Just quilt a little bit on it. You have to do it in sections and change thread colors anyway." (yes dear!) Setting up the machine for free motion quilting, I decided to start in one of the yellow strips at the bottom. I used a simple meandering pattern with sharp points instead of curves. It went well, so I did a bit more - and more - and more. Then I had to go visit Mom and fill her medicine containers for the week. When I got home, I had a few chores to do, supper to cook, and eat, before I could get back to The Garden Path. Eagerly approaching the machine, the quilting began again. About 8 p.m. the phone rang and I took a break to chat with a friend. Then back to the quilting. Before I knew it - the quilting was finished and it was bedtime! 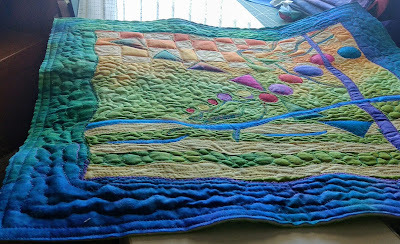 But that doesn't show the texture as well as the natural light did as it shone across the quilt laying on the table. It needs an edge finish and then it will be mounted in some fashion (as yet undecided) to make an artistic wall piece. 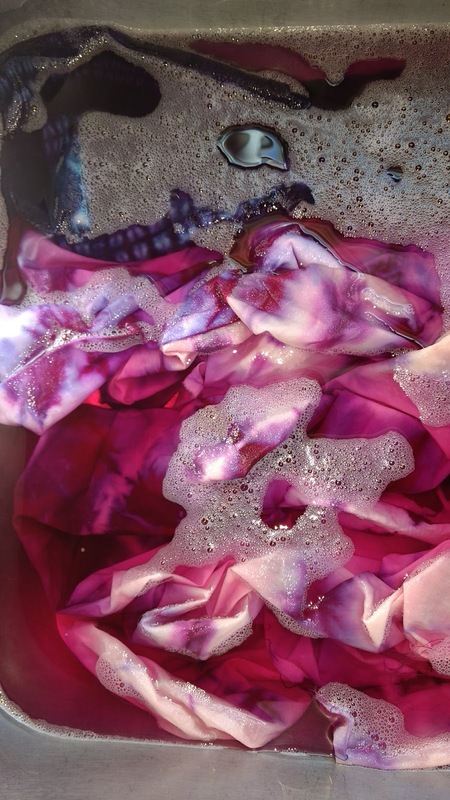 Meanwhile, there is dyed fabric soaking in the sink. The darker part at the top left has stitched resist shibori. My only thought is that I should have used a lighter color and less dye for the stitch resist. But so far it all looks to be another successful dyeing session. I think it looks pretty great!! Isn't it funny when you had permission to just go do a little quilting that you got into the zone and couldn't quit? Yay! A quilt almost finished! Amazing FMQ, as always. This quilt has motion while sitting still! 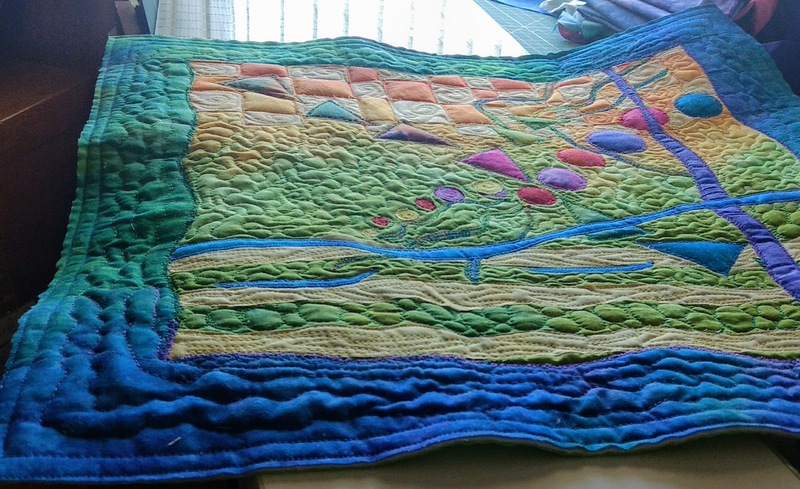 The quilting is gorgeous. I love how the triangles and circles just pop! Garden Path looks great! That's the Citrus gradient isn't it? Hope you will share it in the customer gallery! Wow. It's beautiful. The texture is amazing. YUM! Beautiful! Full of vibrant, happy colour.